Oh to be young and freeeeeeee. I’m making the most out of my twenties by dressing like this every once in a while. Lord knows that when I grow older, I probably wouldn’t be able to pull this off anymore. Cue song: Forever Young, I wanna be…. forever young haha! Funny how the world works. When we were younger, we all wanted to dress older and fast-forward to when we’re legal. Now that we’re older, we want to go back to yester-year. 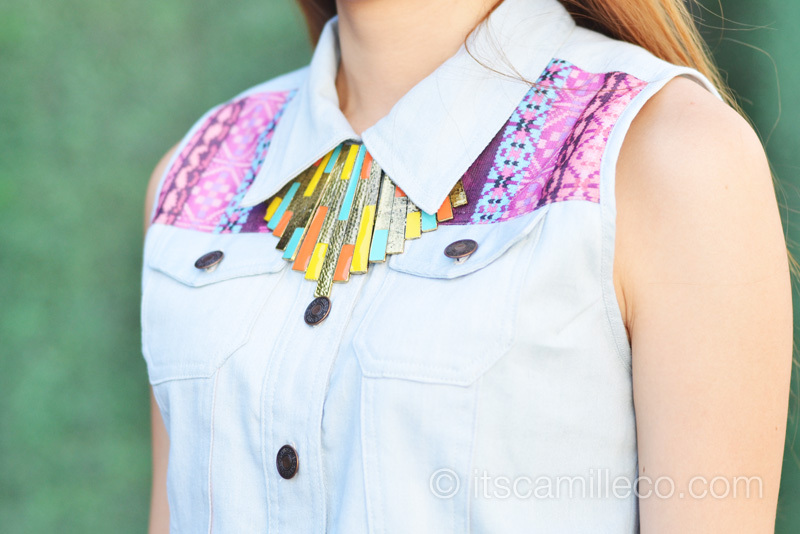 So this I say to you tweens out there, listen to Ate Camille–enjoy your youth. (Akala mo naman napakatanda ko na.) Dress your age and have fun with it! Here’s a little styling tip: if you’re unsure whether your shoes match your outfit or not, strengthen it by accessorizing your look using the same color as your shoes. Even just the tiniest piece of accessory can help. Take my outfit for example. 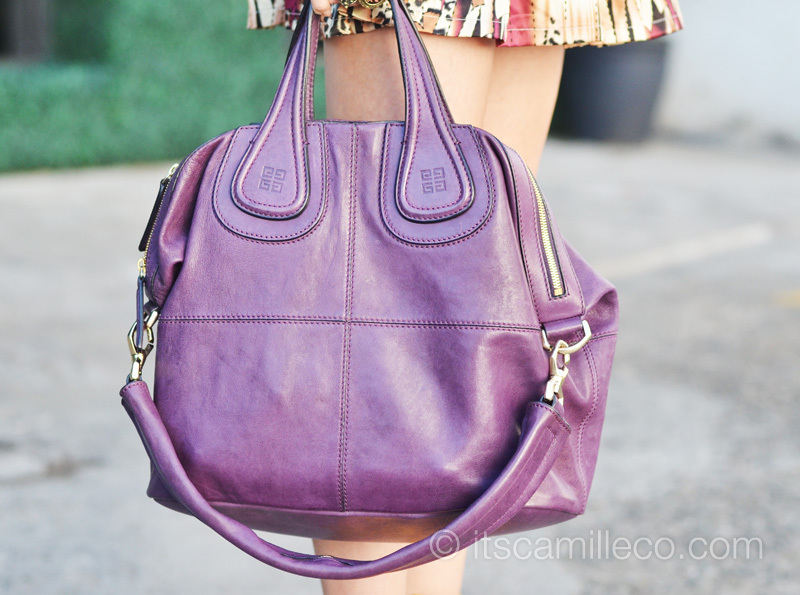 I always say, in choosing which bag or shoes to use, look at your outfit’s colors and pick a color from there. In my case, there’s no yellow/mustard on my top or skirt so I got a necklace with yellow on it. It’s a tiny tiny detail but if you look at my outfit as a whole, it contributes a lot. Plus, yellow/mustard almost always look great with tan/brown, magenta, purple, and blue denim–all of which are present here. A lot of you always ask me how I can last a day in heels. The answer is, I don’t! Like the ordinary girl that I truly am, of course I bring flats with me for back-up! These wedges are HIGH! I need my flats to finish my errands on time. Tada! Purple slippers this time! I told you I love androgynous shoes, slippers included. I LOVE YOU SO MUCH CAMILLE =) You and your outfits. :) you inspire me Camille. I feel like I wanna have my own personal blog too.. I really like you and your outfits..
Oh wow! If you’re old, then how about the rest of us! Haha! Thanks for the fashion tip. :) It will really help me..
What a fun look! I love the skirt, bag and shoes, amazing!!! Hi ate Camille! You are soooo intelligent. I never thought you can actually incorporate that much color and print on outfits until I came across your blog! Hahaha you are so galing :))). Since I know that you have many many many shoes, may I know what brand of pumps hurts the least (hahaha and how long can you stand/walk with them)? I need it for my JS Prom next year. I don’t want to just sit down while my other batch mates are having fun because my feet are already killing me. Thanks! Well it depends. Call It Spring and Aldo usually don’t hurt for me but for others they do. I think you really have to test them out first :) Thanks Jam! AHHHHHH! I feel in love with your shoes the moment I saw them! It’s so perfect Camille! Thanks Sephie! My friends all know how clumsy I am whenever I’m in heels. If I don’t have flats with me all the time, bali na paa ko by now haha! Yeah I bring flats too. Saw how you do it, now I’m inspired. :) Hehe. Indeed, dress your age hehe. cutie cutie sweet.. love the colors.. Thanks Palm! I wonder of this is really your name haha! I love this Outfit!! When I grow up, I would like to be Camille Co but my problem is I’m Chubby and I’m scared to explore more in dressing up because maybe the people will laugh at me. ;(.What shall I do?.I admire you most and Keep Inspiring us. I love your yellow wedges! Love the accessories Cams. What camera did you use? And what setting do you usually set? I haven’t worn them for longer than 3 hours so I wouldn’t know. :) But so far so good! Hi camille! Im having a dilemma in dressing up as betty boop since it was my character in our xmas party. How can i do it in a fashionable way? I love heels but always end up taking them off after a few steps..that’s why i always have flats in my bag. Haha but he loves you anyways! :)Thanks Inca! Oh my God! Givenchy bag!! I want! :) you look so gorgeous as always! nice over all… do you have an exercise routine to maintain a slim/good figure? I am in love with this look :). You look so cute in this look, be like this always :). Your smile is your best accessory and you are looking awesome wearing it in all your pics :). Keep Smiling :). Yes, I agree with you, its funny how all of us crave for things we don’t have rather than enjoying, thanking for what we have and if everyone realize this I think this world will be happy place :). Take Care. Love love love! 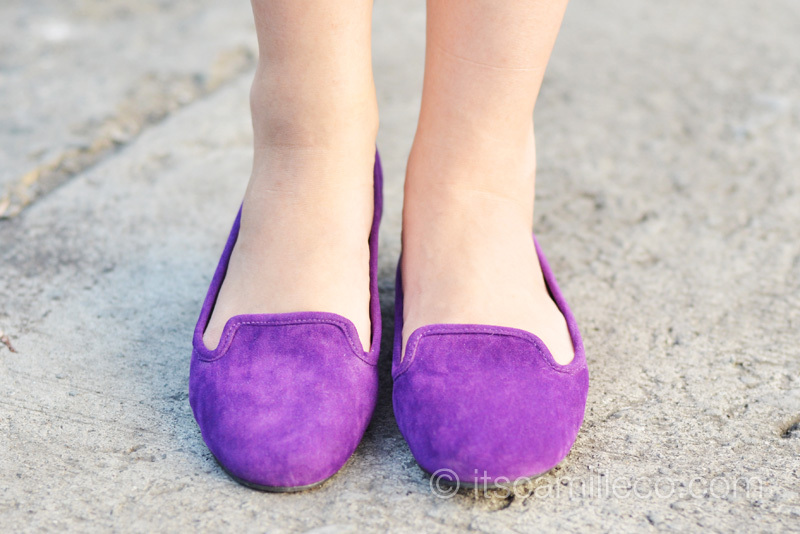 Even with the bright gorgeous yellow wedges, or the comfy purple flat. 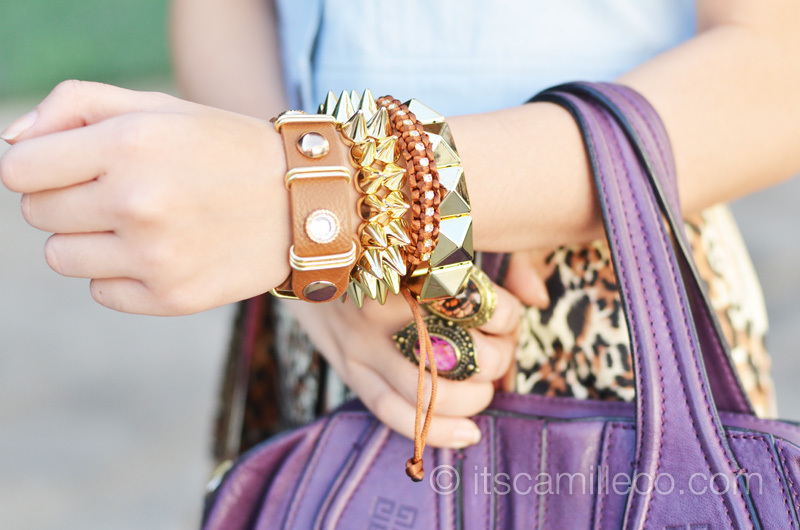 I love how you style and mix all the colours to be something pretty like this. If i were you, i don’t think i would combine the texture skirt with your top, or yellow wedges or that purple bag. But you are so creative and brave! You can make it all beautiful! You’re one of my inspiration, Camille! Thank you Salytheedensy! :) I’m glad you appreciate it! Yes! They really do haha! Thanks Honey! :) Haha funny word: Arouch! I don’t really want to say this but, “hulog ka talaga ng langit Ate Camille!” Besides the fact that pareho tayong confused if we’re going to style ourselves the opposite way of our age or to feel young and wild, you posted a post with “FLATS!! !” I’ve been really wishing for a blogger to style a look using loafers kasi these days loafers’ prices really went DOWN like to the core of the earth (lol) that I can afford one already!!! So excited to buy (obviously)!!!! But I’m afraid di ko rin sya masuot kasi I can’t think of ways how to pair it with both skirts and pants. Hope you’d make more post about flats especially loafers this month so I can take notes and finally choose my new bestie rockin’ loafers! You’re always a help to me, thank you so much! G.R.R.R.R! Haha I can feel your happiness! :) Thank you Charm! Thank you Nadine! Maybe in 7 years, oh no! Love the yellow and purple combination!Your slippers are great!! amazing shoes-I mean the yellow ones! i really like this look!its soo young and vibrant! i also like the skirt and color combinations! love everything about it! Ang lakas maka-liit ng paa ng slippers mo! lavet! So ganda talaga your feet! I’ve seen those wedges on other bloggers, pero sayo talaga, super ganda tignan! PERFECT ang fit! Sa iba kasi medyo mukhang maluwag! Blessed talaga your feet! :D Nagmumukhang designer shoes pag ikaw nagsusuot! At dahil din sa post na to, I will rush to the nearest tomato store to avail their sets of bracelets! Effective Marketing! Di parin ako maka-get over sa ganda ng feet mo! I swear talaga perfect ang fit ng lahat ng shoes sayo! Calling the attention of Kirkwood, Louboutin, Blahnik, Alaia, Steiger, Olympia, Zanotti, Rossi, Choo, Vivier, Hardy, Marant et al… please have Camille Co as your brand ambassador! Girl, gora ka na kahit from thigh to toe lang ang kita sa ads mo! chos! Aww thanks Tasha! Haha you’re making me conscious! Haha Pwede na akong magfoot model? Haha! Oh really? Haha! Thanks Regine! Can I please have your legsss?? :( Hahaha they look endless! Awww okay lang yan :) Yes I did used to feel awkward but now I don’t na. Tall is beautiful! :) Embrace it!